Etrian Odyssey Nexus is the cumulative title in the series and the last entry in a run of 6 games to have graced Nintendo’s ageing handheld family of systems, the Nintendo 3DS. The juggernaut that is Etrian Odyssey is a series that I have personally never experienced before. For this reason, I went in completely blind as to what to expect and aside from the fact that it’s a dungeon crawling RPG, I literally had no prior knowledge of the franchise. Because of this, jumping in with a title such as Nexus was a real gift and a curse. Let me explain. Not having an in-depth understanding of the series made the first few hours – essentially up until the back end of the first dungeon, incredibly overwhelming, with the plethora of options and techniques to get to grips with seemingly too much. Aside from all of the battle systems and inventory management that you need to learn, let alone the bombshell (new to the series, remember?) that you have to fill in your own maps as you progress through mazes. There is also the “small” factor of 19 character types to choose from. Even creating 5 characters to populate your guild early on would be enough to send lesser men to the brink of despair – the amount of choice really is that intense. In truth, I put the game down at the end of my first extended play through and genuinely felt disoriented, the sheer quantity of information consumed, and text read, taking a toll on me mentally. However, they say knowledge is power, and, when approaching Etrian Odyssey Nexus the next day with fresh eyes, a clear head after a good nights sleep and the information that I had consumed the previous night seemingly assimilated into my cerebral cortex, things clicked into place and this massive, inaccessible world suddenly started to become a lot more accessible. Before I knew it I was venturing out to tackle the next labyrinth, jotting down notes on my map as I made my way through the mazes presented to me and having an absolute blast in the process. After defeating a whole slew of interesting and quite powerful enemies I returned to the town, the aforementioned central hub of this world and set out, ready to crawl through my next dungeon. Before doing so I decided to play around with my team a little, experimenting with the vast array of options available to me. I started by creating a few new characters for the Guild of Nintendad, as I felt that some of my current team, the Ronin for example, wasn’t up to scratch in battle and subsequently was letting the team down. I switched him out for a Protector and immediately my party was far more balanced and when I headed out into the next area, I found that I held my own with far more conviction than I previously had done. The choices available are seemingly endless and when it comes to the battle system itself, every little detail can shape how proceedings play out. From deciding on who is bringing up the rear of the party, where more protection but less reach and impact in attack – ideal for a healer, to the point I eluded to earlier, whom you bring with you and in turn what they bring to the balance of the party. It all adds up and is just another factor in providing an embarrassing array of customisable content and in creating an experience that certainly in my own, admittedly limited point of reference, is quite unlike any other. Battles take place in typical RPG fashion with turn-based inputs for all the party characters being given and then executed in one fell swoop wherein the enemies will also take their turn to attack. As well as this option, pressing L makes the battle play out automatically which I found was fine for weaker enemies but often to no avail during meatier fights. There are also special attack’s called ‘Force’ that are available to each individual party member once their meter is full. Force attack’s are significantly more powerful than regular moves and between the huge selection of character types, offer an incredibly eclectic array of special moves. Even more to think about when heading out for your next adventure! Items also play a part in deciding the way in which a battle will go and possessing a sufficient selection of potions and remedies available to you will help to tip the scales in your favour. As a point of contention, this game doesn’t hold up well visually when in motion, even giving respect to the limited hardware that it is powered by. The town of Maginia, whilst essentially being a menu looks pleasant enough, offering an aesthetic that is slightly too anime for this simple scribe, but for all purposes is very acceptable and suitable for the theme of Etrian Odyssey Nexus. In the dungeons, the real crux of this title, things take a turn for the worse as areas look blurry, textures are jarring and movement seems somewhat clunky as a result. That being said, Atlas must be commended for their use of 3D, something that is such a gimmick in this day and age that not even Nintendo even bother with it when putting out content on the 3DS anymore. Whilst visually it leaves a lot to be desired, the soundtrack to this title is absolutely sublime. Yuzo Koshiro, who should need no introduction (though if he does – ‘Streets of Rage’…) delivers stunning arrangement after stunning arrangement, which is a testament to the nuance that he has for delivering opulent video game music. Seriously, don’t let the speakers on the 3DS discredit the stellar work that has been done here by Koshiro and his team, play Etrian Odyssey Nexus with a good pair of headphones. You can thank me later. The way in which the story is told is somewhat unique and certainly offers a different perspective to the usual narrative. Throughout the course of your adventure, you will meet a whole host of NPCs who need assistance with a variety of things. Whilst incredibly text heavy, despite the Japanese speech, there is so much information about this world told through the stories and strife of the non-playable characters. In some ways, Nexus reminds me of the way that studying items in Dark Souls reveals lore about the world in which it is set. By speaking to as many people as possible, you’ll gather more and more information that helps to weave together the overarching narrative. Nexus is a fitting swansong to the Etrian Odyssey series that has graced the 3DS family for so many years now. It really does play out like a celebratory offering and in turn isn’t as fully rounded as one would hope for, almost feeling like a love letter to the fans that have so conclusively backed every subsequent release. The plot is thin, and in all honesty if you’re not looking for it, it is nigh on non existent, but this doesn’t matter one iota as the real bread and butter of this title is the exploration of dungeons and mapping out points of interest as you go, along with building your guild and finding the right balance within your party to take on the worlds dangerous and varied foes. It might not be up to much graphically, with dungeons and movement particularly heinous, but it can almost be forgiven by a soundtrack that just keeps on giving. Yuzo Koshiro, a legend in the video game music scene brings a soundtrack that never offers respite and helps to build trepidation, drama and relief by the bucket load, along with a lot more adjectives that on their own fail to describe just how good the music in Etrian Odyssey Nexus is. All in all Etrian Odyssey Nexus does an ample job of recapturing the magic of the series whilst at the same time making it accessible for newcomers alike to play, despite a lot of information in the games early moments. It is a shame that I have never picked up a title in the series before as mapping your progress in dungeons is just utterly gratifying. 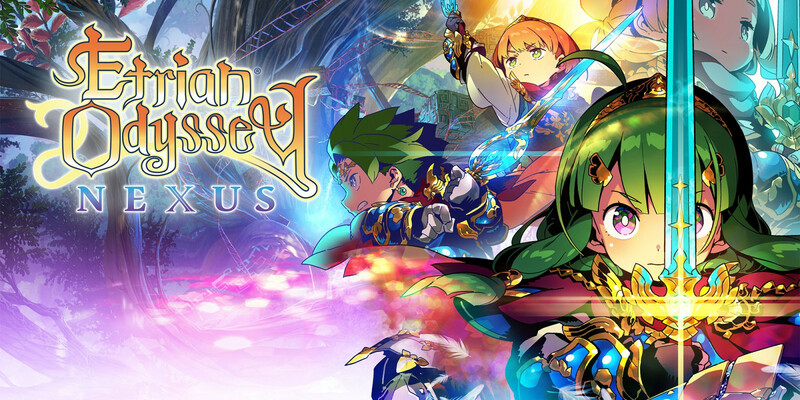 While this may be the end of a glorious partnership between Atlas and the Nintendo 3DS, Etrian Odyssey Nexus has made me eager to see what they bring to the party in the future on the Nintendo Switch.